The question is, should this be able to work, and is it a good idea, or should I just put the distribution switches into L2 mode? Here's a diagram. All 3 switches have all vlans configured, and SVI's created. The core has a 0.0.0.0 route to the internet gateway router, the distro switches have a 0.0.0.0 route to the core. PCs connected to the distro switchs on the native vlan work 100% (can access internet) but when connected to a non native VLAN port (with gateway of the distro switches VLAN SVI) they can only see computers on the VLAN (on any switch in the network) - so VLAN trunking is working at L2, but the L3 routing is not. @Brett-Ferrell Nevermind, I figured it out... left out a static route that I needed. Great job figuring this out, when using static routes the key is remembering to configure static routes on both sides (sending and RECEIVING--sheesh, I can't tell you how many times i've forgotten this). As to the best strategy, this is depends on what you're trying to accomplish between DS1 and DS2 with routing. Thanks, I was really just looking to have inter-vlan routing happen as deep in the network as possible, so everything doesn't have to go up to the core, which I now have working. Next stop is to try to get my Cisco switches to pass Airplay Bonjour multicasts. Thanks again. @Brett-Ferrell On a side note, in studying for my CCNP my reading indicates that doing L3 at the core is really the old way of doing things now, Because L3 switches are practically as much money as L2 these days it's not so uncommon to extend L3 even to the access layer. "deploying a Layer 2 switching design in the access layer may result in suboptimal usage of links between the access and distribution layer. In addition, this method does not scale as well in very large numbers because of the size of the Layer 2 domain. 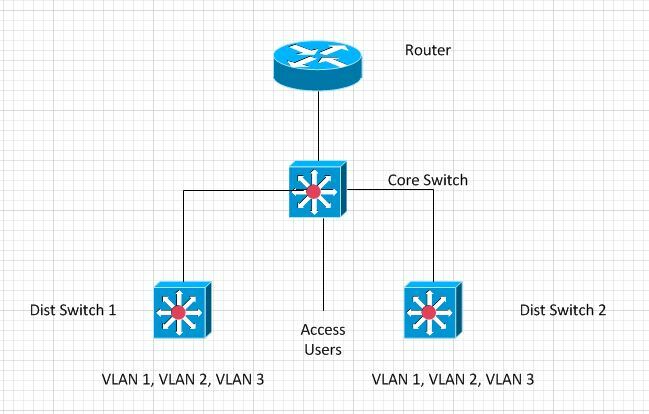 Using a design that leverages Layer 3 switching to the access layer VLANs scales better than Layer 2 switching designs because VLANs get terminated on the access layer devices. Specifically, the links between the distribution and access layer switches are routed links; all access and distribution devices would participate in the routing scheme. The Layer 2-only access design is a traditional, slightly cheaper solution, but it suffers from optimal use of links between access and distribution due to spanning tree. "